Chemical & UV resistance gives longer wear life than ordinary coatings - use indoors or out. The soft, rolling profile provides a non-slip surface that is even comfortable for bare feet— locker rooms, water parks & more! Easy roll-on application with phenolic rollers. Low profile ideal for all traffic patterns requiring an anti-slip surface without being too aggresive. Premeasured 2x1 gal kit or or 4 gal kit packed in a 5 gal pail for easy application. 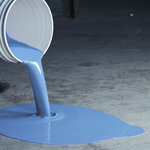 Components Include: 2 of 1-gal Part A (resin), 2 of 1-qt Part B (hardener) - volumes approximate.